Did I hear someone say a phuchka is a phuchka is a phuchka? Not true, if Chef Manish Mehrotra is anywhere around. 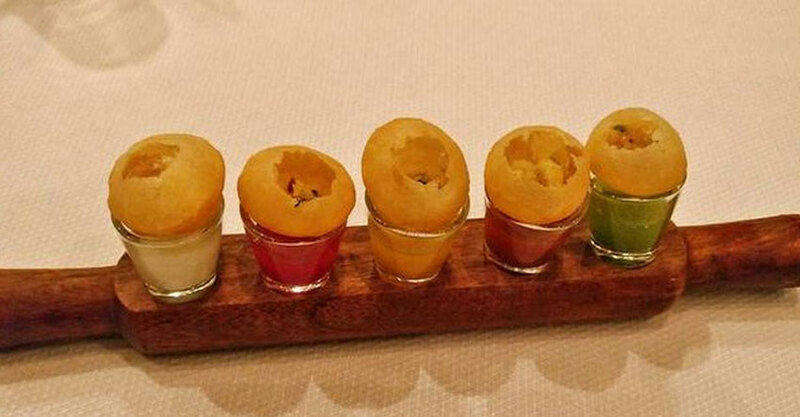 Give him some crispy golgappa puffs, some flavoured water, and he will turn them into haute cuisine. Yet, what’s great about the chef is that he doesn’t play around with the original taste or flavours. He gives you a dish as it is — but presents it in such a way that it opens your eyes. And your mouth, of course! I had a very nice evening at Indian Accent, now at The Lodhi, trying out some of the chef’s special creations. The occasion was a promotion of New South Wales, so quite a few of the ingredients came from Australia. And the food was served with the wine from the region, which is giving a tough competition to established wines from other parts of the world. To get back to the phuchkas, as the golgappa is known in Bengal, the chef serves it atop tiny glasses filled with different kinds of flavoured water — tempered with mint, tamarind, pineapple, pomegranate and yoghurt. There is a masala couscous chickpea mix in the phuchka. You fill it with the flavoured water and pop it into the mouth. Tastes like phuchka that you may have eaten in Kolkata — but looks like an artist’s installation. Chef Mehrotra’s expertise also lies in presenting food — so each dish was delightful to look at, too. The wonderfully sweet-tart-and-salty nimbu pani sorbet, for instance, came in a small pressure-cooker. The Australian lamb cornet was a succulent dish of pulled lamb in a crispy cornet. The spices were just right, and I liked the way the crunchy cornet (baked with refined flour and butter) complemented the juicy pieces of lamb. I enjoyed the baked barramundi, too. The fish came with small boondis flavoured with mint and Amritsari masala butter. The Australian John Dory was excellent, crispy from the outside and moist within. The two regions did a nice tango with the rice — crusted fish dish which was served with a bean foogath and coconut curry. Likewise, the slow cooked lamb with fenugreek came with a small potato chilla, which added both texture and taste — and a surprise twist — to the lamb dish. The dessert — Aamras summer berries and bitter chocolate — was superb. Beautiful to look at, moulded in bright yellow, with bits of red, green, brown and white, it was a delicious dessert with just the right sweet and tart mix and medley of flavours. It was a pleasant evening, with a bit of the old and the new. The old favourites were there, as were some new surprises. The chef says the new dishes would be a part of the menu if there is a regular supply of the ingredients from Australia. As I often say, keep the borders open.